The Montana House is pleased to host another Look Listen and Learn event with a presentation by Jake Bramante. He’s best known for being the first person to hike all 734 miles of trail in Glacier National Park in a single summer. 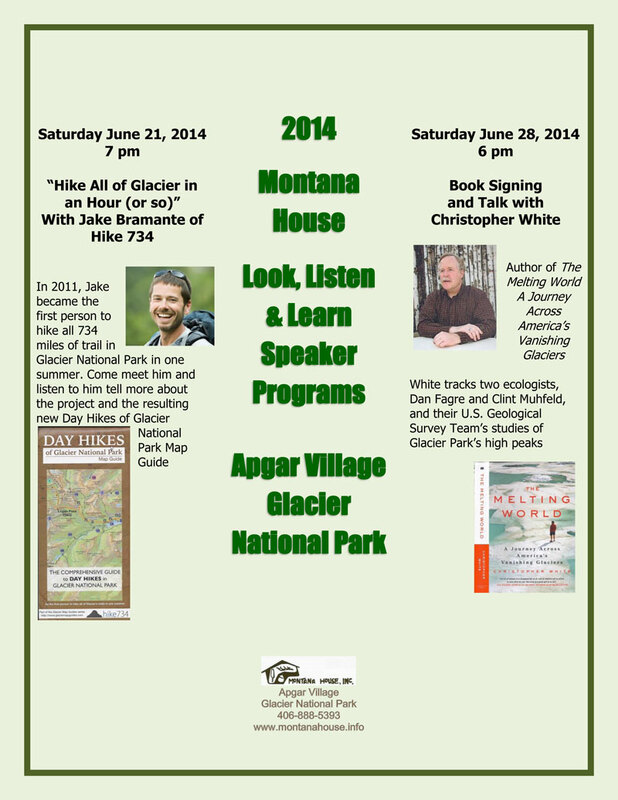 His talk will begin at 7pm at the Montana House in Apgar Village. In 2011, on May 17th, Jake began his walking journey through Glacier and concluded it on October 15th. His presentation explores how he went form IT professional to budding entrepreneur and the inception and completion of the project. Come meet Jake and listen to him relive his journey through photos, HD videos and vivid storytelling as he faced unseasonably high snowpack, injury, panoramic vistas, waterfalls, grizzly bears, birds, flowers, bull moose fighting and more. He concludes his presentation with lessons he learned with applications both practical and inspiring for anyone who needs encouragement to start a challenging endeavor or find the strength to finish. 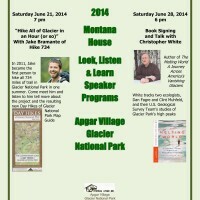 Jake will also speak about his newly published Day Hikes of Glacier National Park Map Guide. The presentation at the Montana House will begin at 7 pm with time for questions and a reception to follow. The event is open to the public without charge, but seating is limited, so reservations are needed. Please call (406) 888-5393 or email: 1960mthouse@qwestoffice.net for additional information and to reserve your seat. Hans and Toni Jungster established the Montana House Regional Craft Shop in 1960 in Apgar Village, just inside Glacier National Park. Their daughter Monica and staff continue to carry on their mission: to celebrate and promote the creativity of Montanan and Native American artists and craftsmen for our mutual benefit. The Montana House has been a long time avid supporter of Glacier National Park. The shop is open all year.